When it was announced on Tuesday that six Academy prospects had signed their first professional contracts at the club, the news of Henri Lansbury turning pro overshadowed the acheivements of the other five youngsters. But for Rhys Murphy and Sanchez Watt, this is the reward for years of hard work and next season they will be out to justify the Arsenal coaching staff’s decision. The fact that these boys have been offered pro terms a year early goes some way to outline their potential, but it is up to them to fulfil it. The news will come as a welcome lift for Murphy who experienced a frustrating campaign last season which was marred by injury. After impressing in 2006/2007 as a schoolboy scoring 17 goals in 21 games, he missed much of last season because of a hernia problem. Nonetheless, he returned to play a key role in the end of season run-in scoring five goals from ten starts overall including a purple patch in which he scored in three consecutive games. The striker, who represented England at last summer’s UEFA u-17 Championships, also scored his first goals for the reserves as he finished the season strongly. Next season will see him strive to become a reserve regular and some good performances could earn him a place in the Carling Cup squad the following season. If he can steer clear of injuries and perform well consistently then there’s no reason why he can’t reach the top. As for Sanchez Watt well there’s not many other ways to describe him other than that he is a special player. He showed glimpses of his talent last season, scoring on his home reserve debut against Portsmouth and finding the net seven times in total for the under-18s. Comfortable on either wing as well as central-midfield there have been rumours circulating that Barcelona were tracking his progress and were considering making a bid for him. It remains to be seen what the coaches have planned for him next season. He will look to play regularly in the reserves but considering he has already trained with the first-team on numerous occassions he can’t be too far away from a first-team call up either. yes lansbury is a special player, but these two have great potential as well. some people have criticised sanchez for his attitude and accuse him of being a bit lazy at times which could hold him back but on the face of it he is a very good player. I have high hopes for Watt. I was excited when I saw him have an early debu for the reserves last year, when he still was to young for the U18 team. I actually think that he could break trough if he progress like he has done so far. He just need to bulk up and make better desicions, and he would allready by a CC material player. 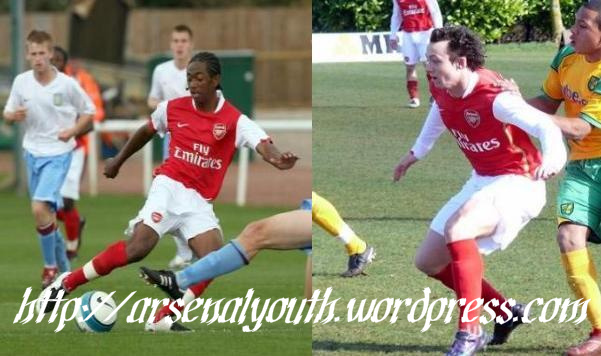 Its so difficult knowing whether or not these really young players will make it or not. Loads of things can happen and there are many disctractions arent there! All I know is, I hope we get as many Arsenal lads thru as possible into the 1st team, who can do a job for us and not just be sold to other, so-called lesser teams. I know Bentley burnt his bridges with his comments and attutude, but can anyone honestly say, he is a worse player thasn Eboue??? Arsenal must really rate them if they’ve been given early pro-contracts to keep other teams at bay. What is Sanchez watts best position? Any video clips? Jay Thomas remains the most interesting prospect to my eye. A Vieira in the making. john i will write an article on thomas cruise sometime next week and as for the barcelona rumour i am not making it up i was informed about it. as for watt’s best position i couldn’t find any videos but if you have arsenal tv online just watch the reserves+under-18s highlights from last season. he can play in many attacking positions but i think he is better as a winger as he can use his pace and technical ability to beat players. Is that Luke freeman on the banner nxt to Henderson at the top? yeah it is, he looks a bit different doesn’t he? Who is the fat b****** at the far right? Is he really fat or is it the angle? it must just be the angle because he doesn’t usually look like that. So does Sanchez Watt have a chance of breaking in to the first team in the future? he does and he is highly regarded by the coaching staff. plus,if he is used as a left-winger then he has a better chance of making it as there are less players that play there. Sanchez was being watched by Barca and i hear they enquired bout him and got rebuffed. I would say the other five had been enquired about too so the club moved fast to secure their futures. Looks like Barca are trying to get their own back for us nicking Fabregas and Merida off them by watching our youngsters now! I heard Sanchezz Watt is a keen musicain and that he favours his music over his football? he is a keen musician but is concentrating on his football at the moment.